You really love your home, but the one downfall is the bathroom. To put it plainly, it’s small. Not just small, but it feels cramped. The shower feels like it’s on top of the sink, which seems like it’s right next to the toilet. There’s no room to move around when you are getting ready, and when guests come to your home, they comment on the small bathroom. If you know exactly what we are talking about, then take the time to figure out some ways to make your bathroom look bigger. First of all, you should know that the bathroom is one of the best rooms to put tiles in. If your bathroom doesn’t have tile flooring in it, then take the time to include tile in your lavatory. If you’re shopping around for tile installation companies, then Zoltan European Floors, Inc. is the perfect option if you live in the Danbury area. When it comes to making your bathroom look bigger, there are a few things that you can do to enlarge it, and no, it doesn’t have to do with knocking down any walls. With these suggestions, all you need to do is focus on redecorating, such as changing the tiles or the light fixtures in the bathroom. No construction is involved for these changes. While you won’t have more room between the sink and the shower, you’ll have the appearance of a larger space. In a smaller space, everything counts, so make sure the changes you make are something you want to see every day in your bathroom. 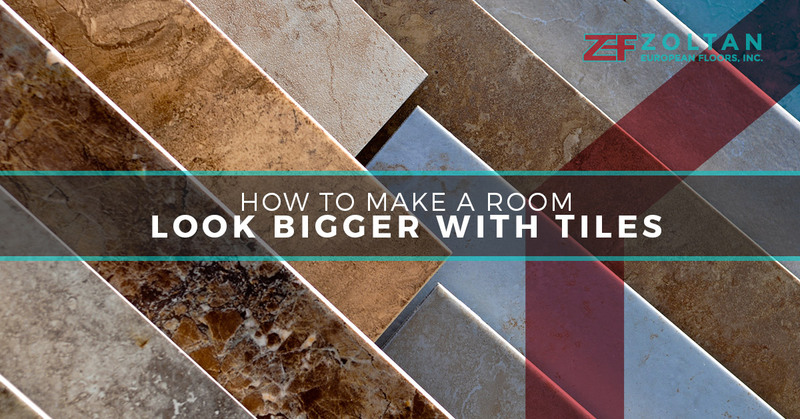 If you want to make your bathroom look bigger, then the best way to do it is to select a larger tile. If you’re redoing your bathroom, then don’t pick small, cute tiles, but ones that are larger and will take up more space. Larger tiles create more width and can make the room look bigger because of the format of it. A tile that’s 16 inches to 18 inches will make the room feel larger than a 12 inch tile. In addition, when you pick larger tiles, the grout lines will look smaller and create more of an expansive, natural look. When you want to make your bathroom look better, you don’t just place the tiles down. You want to place them in a specific way to elongate the room. One way to install tiles is to do so diagonally or on point. The longer look will make the room look wider and longer instead of placing them down in a generic pattern. The diagonal flooring breaks up the room to make it look larger. Lastly to make your bathroom look larger, use contrasts. You can change up the light fixtures to add some more light to the room as well as use clever contrasting looks. Making the room look larger is basically an optical allusion. By making the room bigger and brighter, you’ll utilize the natural light to the maximum. Avoid using darker colors in the bathroom and make it as bright and vibrant as possible. If you’re longing for a larger bathroom, then take the time to try out these tricks to make your bathroom exactly what you want it to be. For more information on redoing your bathroom tiles, contact us today.